Enjoy the benefits of a beautifully finish when you apply our garage floor paint , without the additional expense of professional coating installations . Do - It - Yourself Epoxy Flooring Kits . Epoxy ( enough to cover 500 sq .ft . ) . Two Pairs of Gloves . Drop Cloth / Trash bag . Aluminum Oxide Non - Skid Material . 6 Gallon Bucket with Lid . Instructional DVD and Instructional Booklet . 5 lbs . of chips . Clear Coat Epoxy to seal the chips . * Some additional preparation supplies are needed and are listed in the instructional DVD and Manua . Garage Sealers floor paint is the industry leader in do - it - yourself epoxy products . Using proven coating technologies , you can now achieve professional looking results in an easy to apply package . Your plain gray , porous , concrete floor can be transformed into a beautifully finished , stain resistant , easy to clean , attractive floor - and now you can do it yourself . 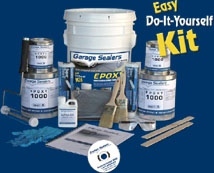 Achieve professional - quality results with Garage Sealers Do - It - Yourself Paint Kits , the best overall epoxy floor coating product available in the industry today . With Garage Sealers Do - It - Yourself Kits you get the experience and the industrial strength products necessary for you to achieve a beautiful finish that lasts . Order today with our easy online ordering . For those who take pride in their homes , Garage Sealers is the one to trust . Get your entire garage covered .